Chrysler began production of the Pentastar engine family in March 2010. It's now used in 16 models in 11 segments. DETROIT -- The last of Chrysler Group's old V-6 engines has been replaced with a 3.0-liter version of the Pentastar V-6 that is being launched first in China. Chrysler introduced the engine today in the 2014 Jeep Wrangler and Grand Cherokee at the Chengdu Motor Show in China. Chrysler makes the engine in Trenton, Mich., and ships it to China. Production started on July 3, and the first engines were shipped to China July 22, Chrysler said today. The engine, based on the same compact 60-degree architecture as the 3.6-liter V-6 used on such vehicles as the Chrysler Town & Country and Ram Pickup, is rated at 230 hp and 210 lbs.-ft. of torque. 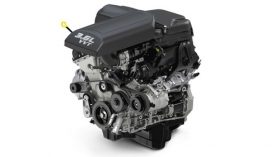 With the addition of the 3.0-liter, all Chrysler's V-6 engines are in the Pentastar family. Pentastars are used in 16 models in 11 segments. Chrysler began production of the Pentastar engine family in March 2010 and has been gradually phasing out production of seven older V-6 engines.